Alarmist Propaganda: Does “Warmest” Year Mantra Mean Climate Squat? The global warming slowdown (or "hiatus," "stall," "plateau," "pause" and etc.) has been widely discussed across a broad spectrum of web and print publications, including prominent science journals and peer-reviewed research, which indicates a 100% acceptance of the extended slowdown. The realization and analysis of this lack of significant warming has produced a cornucopia of studies and expert opinions as to why the global climate went into a completely unexpected stall mode - so far, there are some 50+ scientific rationales that have been put forward to explain the phenomenon. Since climate science remains unsettled, the current consensus is that there is a non-consensus regarding the globe's dramatic deviation form the CO2-centric "expert" climate models. Indeed, there is no shortage of empirical evidence documenting the ever-enlarging discrepancy. Unfortunately, despite the indisputable and consensus scientific recognition that a temperature plateau exists, and the lively debate within science circles as to why, there are elite green alarmists who claim the 'standstill' is a hoax or does not exist - essentially, that is sheer climate-change denialism by deniers performing in anti-science, denialist roles. On top of such denial travesties, the mainstream press is trying to change the focus away from the significance of the global warming slowdown and climate model failure to the incredibly small increase in warming that allows them to shout report that 2014 is the "warmest" year ever. The term "warmest" (as in day, week, month, spring, summer, autumn, winter, year, decade and so on) has become the last propaganda refuge of those who either deny the global pause or just want everyone to forget its importance. 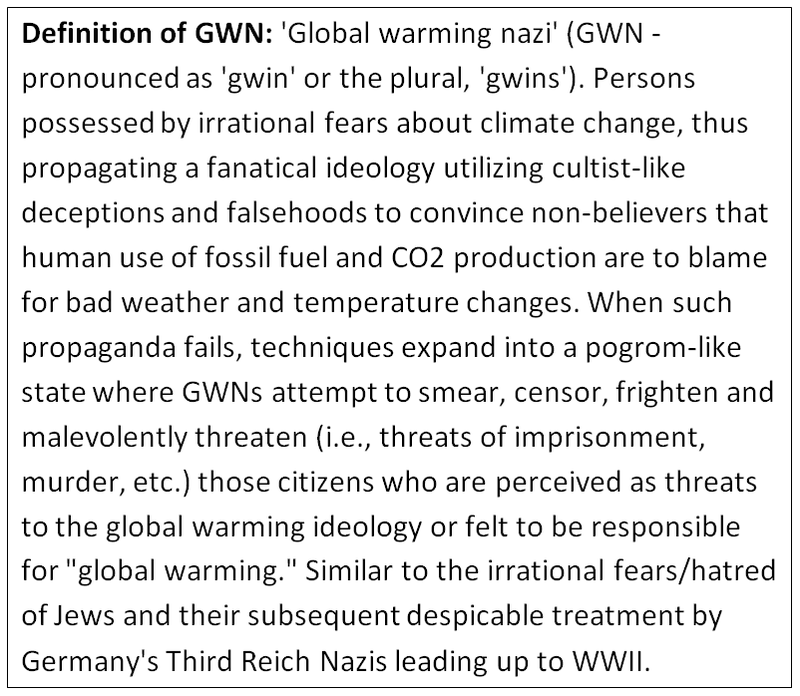 Utilizing the terminology of "warmest" reveals the ultimate cherry-picking agenda. However, since the Little Ice Age (LIA) end during the 1800's, the world has been constantly producing new "warmest-ever" records - it's entirely normal within the climate record, and will happen even when a temperature change hiatus exists. To that point, both warm and cold years can coexist during longer periods of temperature stability, as multiple global and regional records demonstrate. In addition, it's unquestionable that severe/extreme weather events can take place, regardless if it is the "coldest" or "warmest" year. As the adjacent chart depicts, rapid cooling and warming climate changes can occur very quickly. The chart plots both the acceleration and deceleration of temperatures (ie, per century trends) over moving 12-month periods (light red curve) since 1850. Over short-term horizons, global temperatures have been known to accelerate/decelerate at a ±70°C rate. Since 1999, there have been periods when temps increased at a +35°C/century rate, which would obviously produce some very warm years; while during the same 15-year span, there have been periods when temps decelerated ay -39°C/century rate, which would have obviously produced interim cold periods. This is what the empirical evidence shows. Now think about that last paragraph. Over the last 15 years there has been incredible shifts in temp trends, yet the mainstream press doesn't report on that. Instead the press reports excessively about a given period being all of 1 to 2 hundredths of a degree warmer than a previous year. The robust alarmist hysteria of "journalism" is sadly evident 24/7. Okay, back to climate reality and the basic facts: Temperature changes. Trends increase, then decrease. It just happens. It's natural. It will continue to do so. And it has occurred since instrumental climate records have been kept and proxy temperature reconstructions have been created. 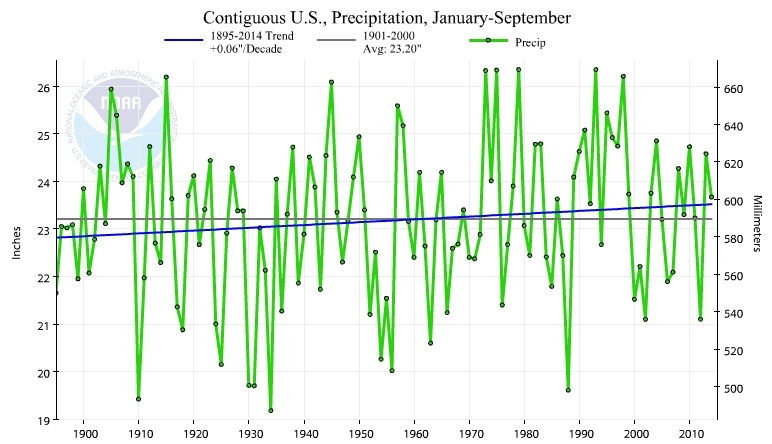 Speaking of instrumental records, back to the included chart for more evidence of extreme climate change. The HadCRUT4 instrumental record since 1850 shows some big extremes, which have been identified on the chart as those periods exhibiting temperature trends greater than ±50°C. Those specific warming and cooling extreme incidents have been identified with the years they took place, and there are some common traits recognizable. All the huge extreme changes took place over 40 years ago, with the vast majority being prior to 1950. The huge CO2 emissions have not produced a single global warming acceleration extreme since 1951, over 60 years ago. Since the 1970's, the climate extremes' range appears to be narrowing, with each accelerated warming and cooling trend rate getting smaller. And when major (minor too) extremes occur, the climate system does not hit a "tipping point" of positive feedbacks. Instead, the natural climate responds with negative feedbacks to bring the climate back to some level of short equilibrium. The chart also plots the moving 180-month (15 year) acceleration/deceleration of temperature trends (the dark blue curve). Clearly, despite all the modern CO2 emissions, all the gyrations of the 12-month per century trends, and all the recent "warmest" years ever, the 15-year global warming trend has not deviated much from the past. Statistically, as of October 2014, that trend is below the median of all 180-month trends that took place in the past ( 1,801 1,799 trend datapoints to be exact). Sidebar factoid: During 1922, the 15-year per century warming trend reached a level that was 3 times greater than today's 15-year trend - that is a trend sans the gigantic cumulative human CO2 emissions resident in today's atmosphere. Is 1922 the only pre-1950 period when the 15-year trend exceeds today's? Nope (remember, October 2014 is below the historical median). What does all of the above mean? As shown, those stubborn facts of empirical evidence are relentless. The continuing long-term, natural warming climate trend since the LIA has been a constant, yet combined with amazing short-term periods of abrupt change that produce exceptionally warm years and cold years. These are the scientific climate facts. They are unequivocal, immutable, indisputable, irrefutable, undeniable and non-debatable. It's called natural climate. It happens. Now, all of the above should not go without the following caveats: today's temperature trends are not forever. Trends are not predictions nor projections. As the plotted evidence indicates, the climate can change rapidly, going from cooling to warming back to cooling over short time spans. Any cool/warm trend has the potential to become a much longer, climate significant trend. And it's reasonable caveat to assume CO2 emissions have an impact, but likely a very trivial one (and easily overwhelmed) versus the natural climate change impact. There is no expert (of course, that doesn't keep most experts from speculating) who can predict how much longer the pause will continue and whether it will morph into global cooling or a return to greater warming. And by the way, if the latter, many people are already debating that potential and what it will mean - more confirmation that climate science is never "settled." When one connects the dots, so to speak, at the end of the day there have been absolutely zero climate models and/or experts that predicted the recent empirical climate outcomes that the above chart delineates - that's correct, none. And finally, the infamous "97%" scientist consensus that CAGW proponents often fall back on when empirical evidence, such as above, eviscerates their CO2-warming alarmism, has been seriously and embarrassingly debunked, multiple times. Read here and here. Note: Source for monthly HadCRUT4 anomalies used for chart. Utilized Excel to calculate 12-month and 180-month (moving) slopes (ie. trends), then multiplied by 1200 to produce per century trends. Then used Excel to plot per century trends. The known climate science of global warming is not a mystery. It is well documented climate physics that just about every scientist agrees with. And for the layperson, it's not terribly difficult to confirm. 3. A spreadsheet to make the necessary calculations and then plot the outcome. These items were used to produce the adjacent chart. Five different time periods were chosen, then the warming (degree C) per CO2 tonne was calculated for each time period. The resulting datapoints were then plotted and connected with a fitted trend (6th order). Clearly, this actual climate science empirical evidence substantiates the known climate physics. With this confirmation, one could assume that all warming since 1850 was due to human CO2 emissions, but then the logical conclusion is cast in concrete science - CO2's impact is shrinking towards zero, as observed, and likely will have even a smaller global warming impact in the future. Note: The chart's fitted trend provides a sense of direction in the past but it has unreliable predictive qualities (if any). Why 1950-2013? Because the IPCC claims human CO2 is principal cause of warming since 1950. Why 1988-2013? Because in 1988, NASA's James Hansen testified that CO2 warming was accelerating and dangerous (it's been neither). Why 1997-2013? Because, it's been approximately 17 years with the 'paused' global warming. The 1850-2014 period assumes 17.5 gigatonnes of CO2 for first 7 months of 2014. Used 12-month HadCRUT averages to calculate deg/tonne. Adjacent are the top 5 reasons the global warming hysteria has failed. They are called empirical evidence - datasets of temperature observations confirming there has been no statistically significant warming for over 15+ years. The "consensus" "experts" and billion dollar computer climate models predicted that human CO2 emissions would generate accelerating, catastrophic global warming. But it hasn't happened - ooops! Connect The Dots: Is CO2 Turning Earth's Atmosphere Into A Venus Cauldron As Predicted? In a previous post, empirical observations documented the lack of both short-term and long-term warming of the atmosphere. Another approach to assessing the atmosphere's temperature change is to examine the 10-year changes in the lower troposphere. The graph on the left plots such changes. Using a satellite dataset that contains 426 monthly temperature measurements, 306 moving 10-year changes can be calculated. This graph plots those 306 data-points (the proverbial 'dots'), plus the cumulative growth in CO2 levels over the same period. Visually, it is obvious the 10-year temperature changes were dominated by increasing values up till the early 2000's. After that, the 10-year changes decreased consistently, turning from positive to negative. The graph depicts the global atmosphere actually cooling over recent time. The long increase in 10-year temperature change, and then its subsequent decrease, is confirmed by both the 3-year simple average curve (aqua) and the fitted trend curve (6th order polynomial). The pale green curve (another fitted trend curve, 6th order) represents the unabated, relentless cumulative growth of atmospheric CO2 levels. Conclusion: Earth is not turning into Venus. The experts' predictions that human CO2 emissions would turn Earth's atmosphere into a simmering Venus lookalike, resulting in "boiling" oceans, is now substantiated as a crackpot, global warming bogosity - pure anti-science alarmism that was promulgated by establishment science. Does the above mean that Earth's atmosphere will never warm again? Nope, it will indeed continue to have phases of warming and cooling just as it did in the past, sans Venus conditions, though.....because that is what climates do, just naturally. Note: RSS June 2014 satellite dataset used in Excel to calculate 10-year temperature changes. fitted trends and 3-year average in the above chart. Hey, don't know how to chart in Excel? It's easy to produce charts - you can do it too! Go here to learn how. The just released BP Statistical Review includes an updated historical record of CO2 emissions across the world, through 2013. While China's CO2 emissions have almost tripled since the Kyoto Protocol of 1997, the U.S. emissions have decreased about 2%. With that said, any CO2 emission reduction by the U.S. is being immediately offset by the huge increases happening in other parts of the world. As a result, neither U.S. citizens, nor the world's, are benefiting from any U.S. CO2 reduction efforts. To make the U.S. CO2 reduction aspirations even more bleak, if America could slash its emissions by 50% for each of the next 85 years, the net impact on global temperatures by 2100AD, at best, might be all of a measly -0.09°C. That type of impact would require U.S. emissions to drop by some 3 billion metric tonnes per year, which based on today's technology, would likely amount to at least an annual $1 trillion expense (assumes a ludicrously low $400 per tonne cost to immediately replace all the lost fossil fuel utilization, needed new infrastructure, replacement transportation vehicles and g*d knows what else to survive). Previous greenhouse-gas postings and charts. It has been predicted by the climate "experts" that human CO2 emissions would cause the world's atmosphere to warm dangerously, producing catastrophic, world-ending climate disasters. Some 30+ years later, the advanced satellites circling the globe, 24/7, provide the empirical evidence that the "expert" predictions were of no substance, nor merit. Now, that is the short-term. What about the long-term? A recent study by a group of pro-catastrophic global warming scientists1 determined that the human CO2 warming influence on atmosphere temperatures would be obvious over 17-years of satellite measurements. These are the scientists who claim we have experienced catastrophic global warming, with world climate disasters being imminent. And what has happened, over this long-term span specified by these scientists? Over the last 204 months (that's 17 years through June 2014), the atmosphere temperatures have actually exhibited a global cooling trend, not warming. The per century trend is only a -0.36°C. Despite this small number, it still represents a cooling trend, opposite of consensus predictions. Whether short or long-term, the state-of-the-art empirical satellite evidence is not only obvious, it is both climate and statistically significant: CO2 emissions have not had a significant influence (warming or cooling) on atmospheric temperatures. For objective science, this means that the CO2-centric anthropogenic global warming hypothesis is essentially invalidated, as it is currently understood. 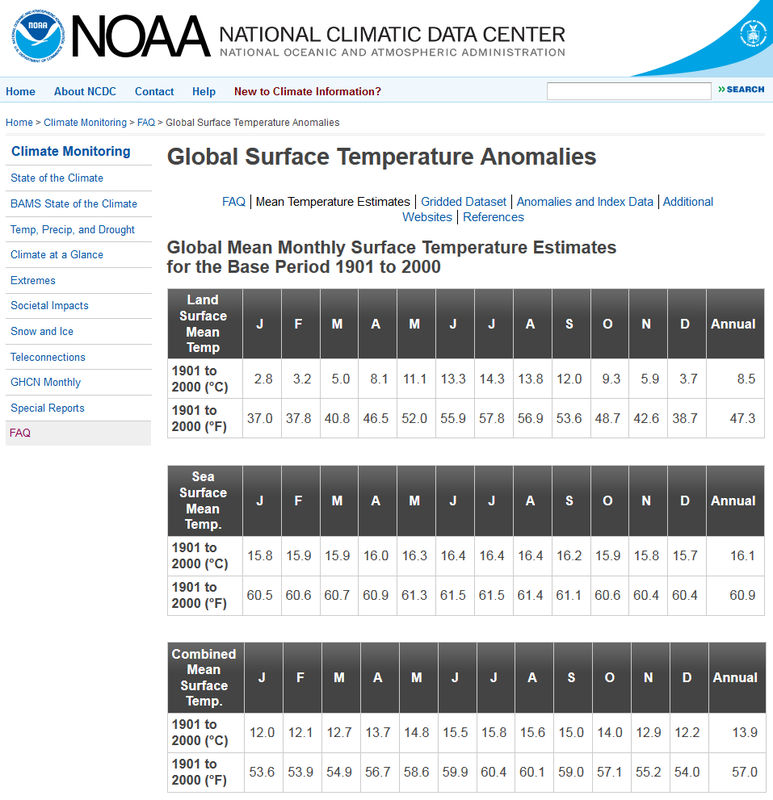 Note: RSS June 2014 satellite dataset used (finally!...updated with RSS June 2014 Excel spreadsheet), including 6-month temperature changes and Excel linear trend in the above chart. Hey, don't know how to chart in Excel? It's easy to produce charts - you can do it too! Go here to learn how.